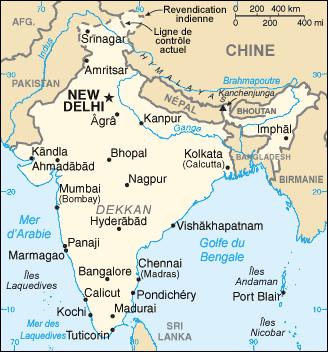 India : When and where to go? Country of excess, India provokes very intense feelings in those who venture there. Delhi, the capital, offers many treasures that the country has as a whole: Countless museums, all categories of restaurants with delicious food, magnificent monuments, various cultural events, all of which can be discovered within the two different worlds of Old Delhi and New Delhi. Agra, 2 hours by train from Delhi, is well known as the home of the Taj Mahal, a beautiful white marble palace built at the request of Emperor Shah Jahan in honor of his love for his deceased wife, this building is justly famous and considered unequaled in its serene beauty by many throughout the world. You should not miss Benares (now called Varanasi), the holy city on the west bank of the Ganges, where you will see various funeral processions on their way to cremations, as well as the pilgrims that come to wash away their sins, also you can discover the Vishwanath Temple, also known as the Golden Temple. Goa, the smallest state, made famous by the hippies during the sixties; has great beaches and coconut palms, a relaxing tropical atmosphere and the people seem to be friendly and happy. In southern India, you will be astonished at the beautiful landscapes of Kerala; the rice fields and tropical plants, the endless beaches and the Thousand and One Nights Palace, the wildlife, rich spices and iridescent colors. Mumbai will turn your head with its excessive and heterogeneous world: Traffic congestion, continuous deafening noise, pollution - everything takes place against a backdrop of impressive sights with a multitude of bazaars, very fashionable boutiques and establishments at the forefront of the twenty-first century. Here, the abject poverty rubs elbows with the air-conditioned shops. However, this city has a special charm you cannot ignore. Madurai with its temple, Udaipur with its palace on Pichola Lake, Jodhpur with its Fort close to the desert, or the various national parks and safaris, where you can see the splendid tigers, all of these will offer wonderful visits during your trip to India. Many travelers are touched by this country: Some of them come back with a tenacious nostalgia close to that of addiction. Your challenge will be to define what makes it so charming and deeply moving that you will probably want to come back: In any case, you will almost certainly find that one visit is not enough! Travelling to India by air is the easiest way: You land in Mumbai, Delhi or Madras. You must have a visa before your journey because you will not be able to get it on arrival. Attention: Make sure you have all the documents required for issuing the visa. The currency in circulation is the Indian Rupee. You can easily change your Euros or Dollars. It is said of India that the cost of living is next to nothing, it's true, except at some places in Mumbai or Delhi. A decent meal can cost less than €5 and a comfortable and reasonable double room less than €15. The food is varied and often delicious and you will discover many specialties depending on different areas and restaurants. The types of accommodation are numerous, mostly hotels from all categories: Choose the one best suited to your budget and taste! Regarding health, take precautions with food: Only drink water from sealed bottles or purified or boiled water, avoid ice cubes and frozen products. Take precautions against diarrhea and follow instructions to protect yourself from malaria if you are believed to be at risk. To travel within the country, domestic flights have recently increased. The train is a possible option, despite its slowness it is cheap and goes everywhere. The buses are less crowded than trains at almost the same price but they are not very comfortable. In large cities, there are a lot of taxis, rickshaws and tongas. You can also rent a bike for less than €1 per day.